Tabular Figures are monospaced. They’re ideal for columns of numbers that have to add up or be compared because they always line up vertically. Proportional Figures (like proportional type) are designed for ideal letterspacing between characters. When you’re not dealing with rows and columns of data, they are easier to read. Use them whenever numbers are embedded in text. Lining figures are also called Regular Numerals or Titling Figures. Lining Figures are most commonly included with digital typefaces that only include a single set of numerals. Uniformly the same height as capital letters, Lining Figures sit on the baseline of the type (though they are sometimes of a lighter weight than the capitals). Use Lining Figures for forms, tables, business reports or any place alignment is critical. Less-used but still important are subscript and superscript figures, numerators and denominators. Subscripts and superscripts are used in chemistry and math. Numerators and denominators are used specifically for fractions. Though special figures are available across all font technologies, the easiest way to access them is to use an OpenType typeface. (OpenType will be the subject of a forthcoming article). In Adobe InDesign, the Character menu offers quick access to a wide range of typographic alternates. Additionally, a Glyph palette allows you to select a character within the text and choose an alternate from a popup list. It’s easy to judge a typeface by its cover and end up with a poor selection if you don’t understand what tasks it will have to perform. Even some of the old standards may not have what it takes to get you through the typesetting process. 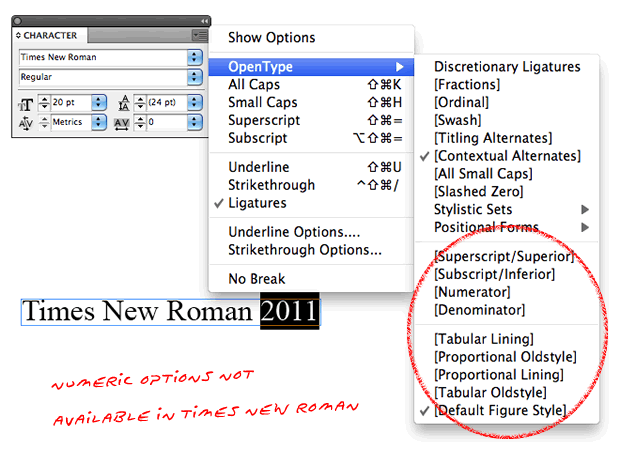 Look for OpenType typefaces and typefaces with “Expert” options. Think carefully about your content. Even if your book is a narrative with few numbers in it other than a few dates, it will benefit from a set of Oldstyle Figures. If you’re writing a business or math book, a set of Tabular Figures is essential. 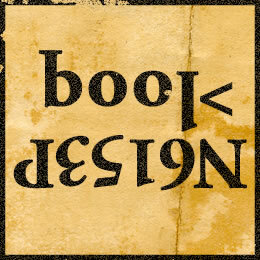 If you can find a designer who knows what Oldstyle Figures are, your book is probably in good hands. If you are typesetting your own book, an understanding of typography basics will empower you to produce a result that honors the effort you put into your writing. Addendum 2: David Bergsland mentioned that I overlooked Small Cap Figures. Though the use of small capital letters in typesetting will be discussed in a later article, it’s important to use figures that are sized proportionately to the letters. Not all typefaces include Small Cap Figures, so choose your fonts carefully to ensure they’ll meet your needs. Addendum 3: The primary use of superscript numbers in books is for footnotes, which might warrant some discussion themselves in a later Part, not scientific/technical things. This is especially true for the target audience of this great site.